I have a few more things to post since the last time I wrote. 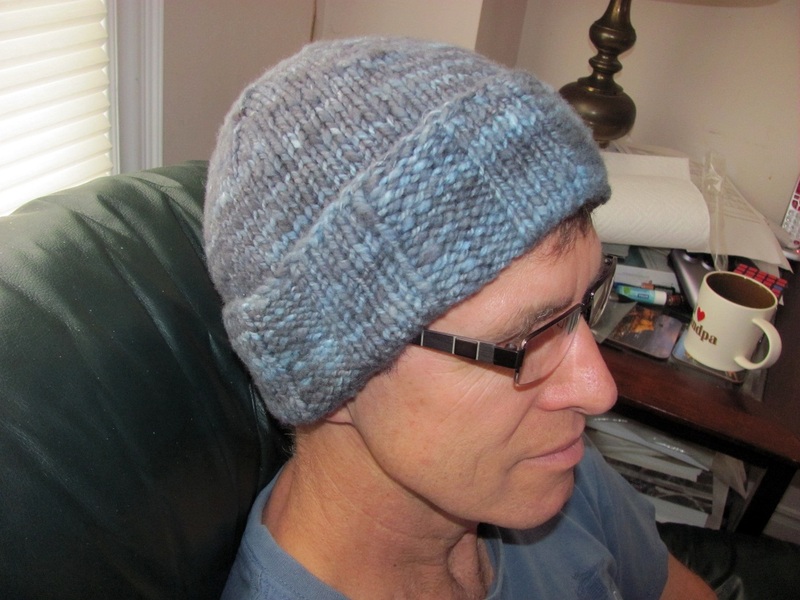 I finished dyeing up the bulky yarn that I’d planned to turn into a hat for John and then I knit the hat. 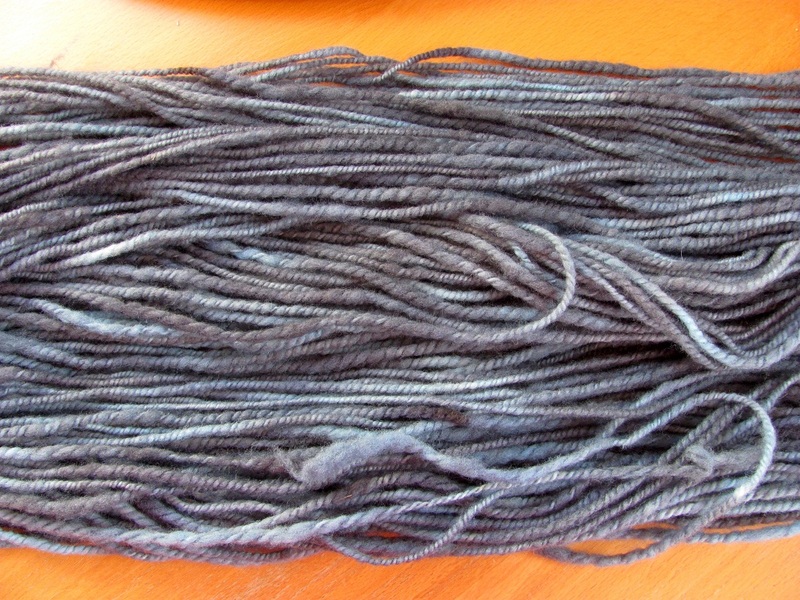 Shetland homespun yarn dyed with Jaquard’s Sapphire Blue and over-dyed with Jaquard’s Jet Black dye. Shetland bulky homespun knitted into a hat, the pattern is called Jason’s Tweed Hat by Melissa Thomson of Sweet Fiber Designs. Aunt Grace “Scrapbag 2006” – Marcus Brothers textiles. 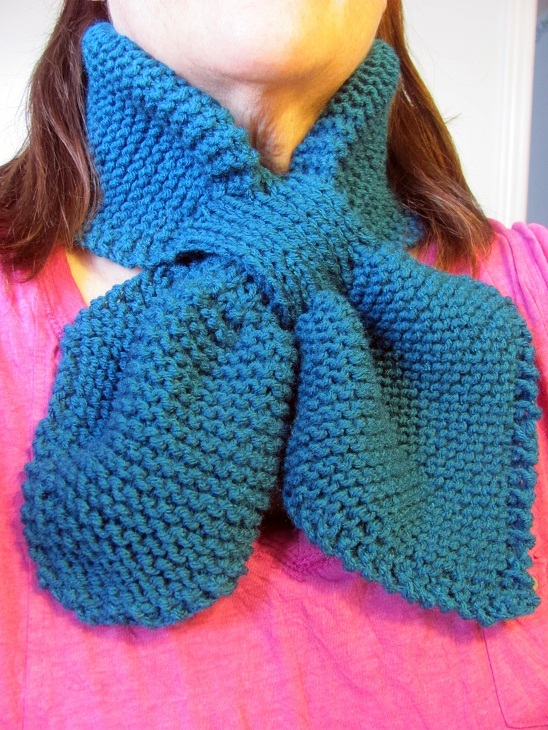 One of the girls in my Ravelry forum groups posted a cute little scarf and I immediatley thought of my mother-in-law who likes this type of scarf where you can put one end through the other, I think it’s called a keyhole scarf. Anyhow this one was a quick knit that I did while watching the Olympics. I just used a simple acylic for the yarn as she is allergic to wool. Miss Marple Scarf by SusanneS-vV, done in Red Heart Supersaver. This looks like the bulky yarn that I spun for John’s hat and it is wool from the same fleece but this time the yarn I spun is finer more of an Aran weight yarn. I’ve spun up two of these so there is about 360 yards. I was going to spin two hanks and then dye them together but I’m not sure what project I’m going to use the yarn for. I was thinking of an Aran sweater for one of the grandkids so I guess I’ll research the yardage needed and go from there but meanwhile here are two hanks of Shetland White. 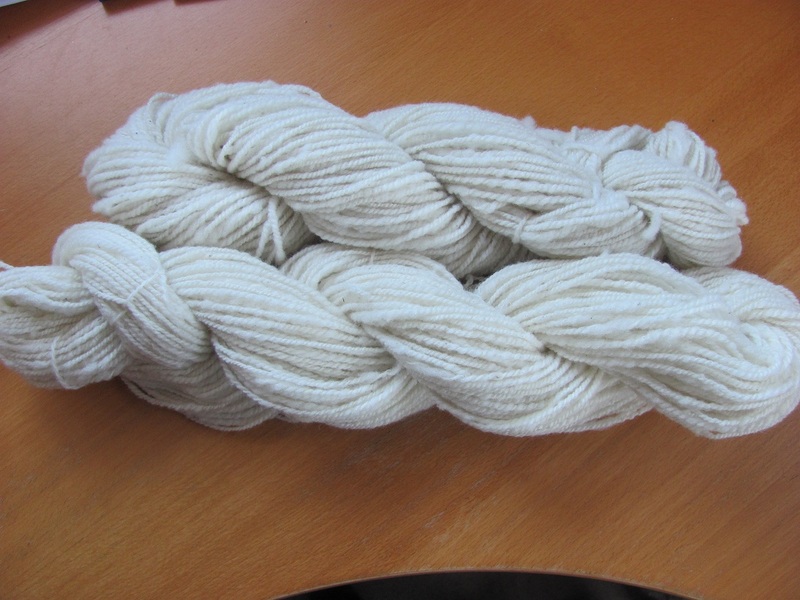 Shetland White homespun, Aran weight approximately 360 yards. Finally I thought I’d share some fiber that I have sitting out ready to be spun into something (at some point). 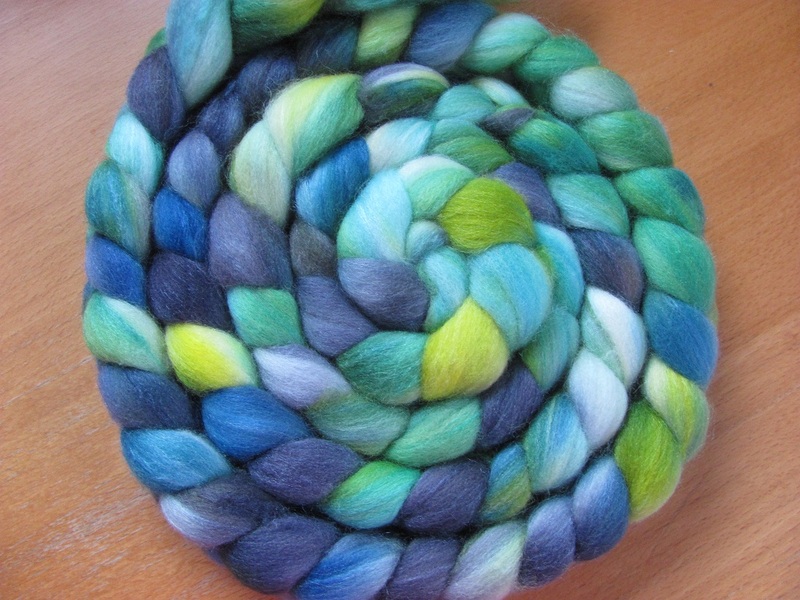 Some pretty eye candy, I always like seeing fiber on blogs so here is some of mine. 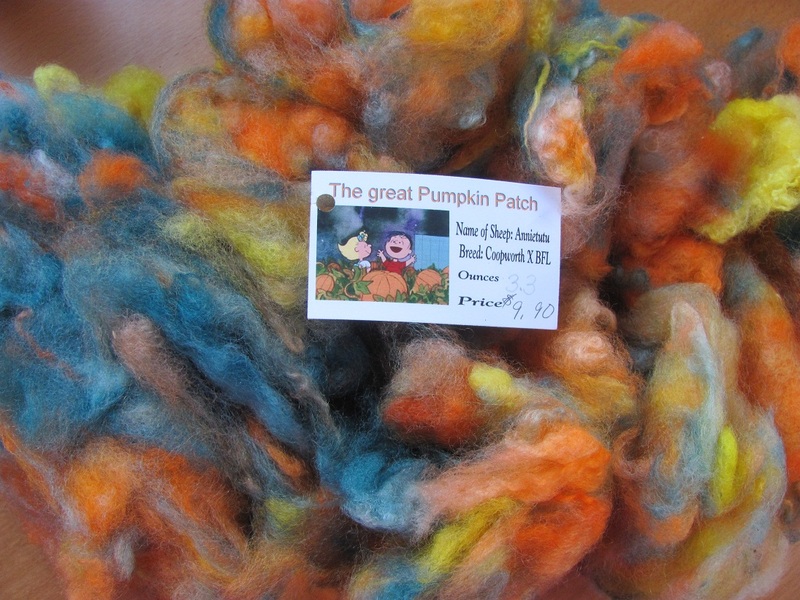 The Great Pumpkin Patch dyed by Vickie from Vickie’s Raspberry Hollow, This is a Coopworth/BFL wool fiber. Northern Lights dyed by Karen Burren Stained Glass Art. This is a merino/silk blend. That’s all for now. 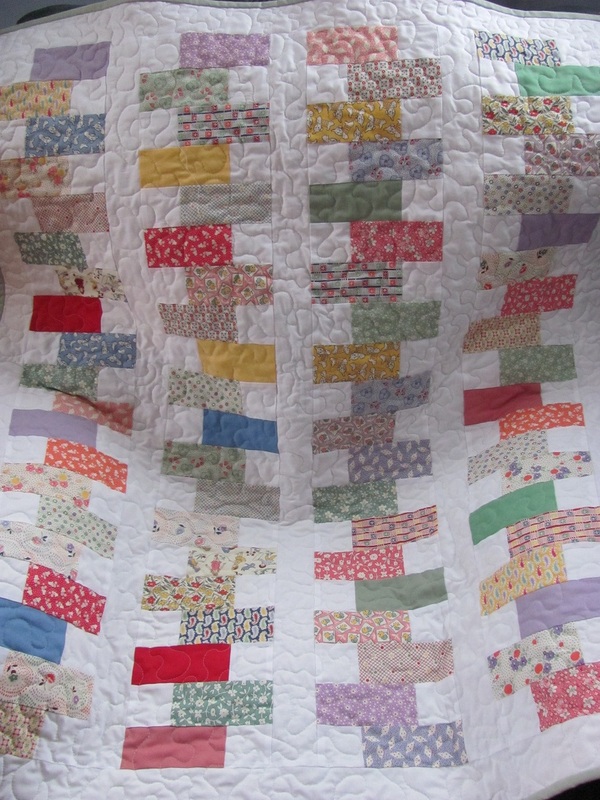 I’m not sure what I have planned next but I’m sure it’ll be more spinning and maybe some more quilting as well. 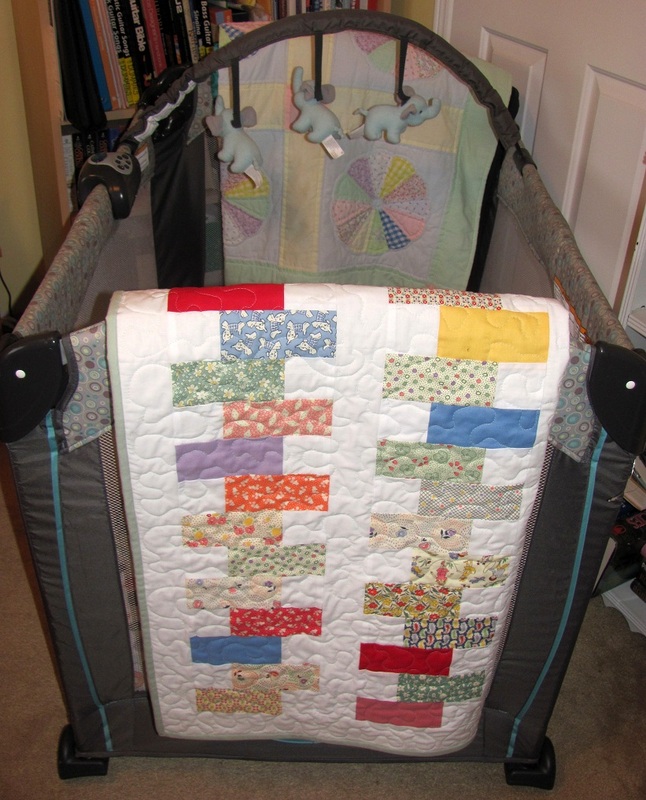 Now that I’ve done the two baby quilts I realize just how much fabric I have so I need to get some more sewing done. This entry was posted in Knitting, Quilts, Spinning and tagged Aunt Grace fabrics, baby quilt, homespun hat, Jason's Tweed Hat, Miss Marple scarf, spinning. Bookmark the permalink. I love the hat, it looks so cosy and warm, so squishy! 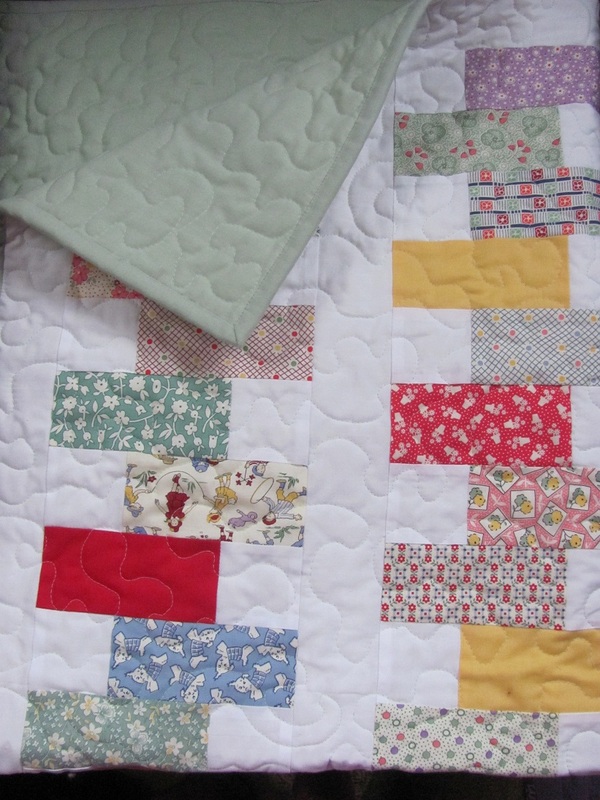 That quilt is beautiful. I’m going to have to attempt making one like that one day. I can’t wait for the holidays when I will have more time to do so. The fabrics are beautiful. The keyhole scarf is nice and chunky and I imagine it would be warm in this cold weather we are still having. Again, like I said on Ravelry, I love that white handspun, it looks so even and white! I’m terrible for never knowing what to knit with my handspun, I have a cupboardful! Fiber fiber fiber! Can never get enough of seeing fiber photos either! 😀 I love those braids but I find they are pretty expensive so have never had any, except for the one I was given at Christmas. They are so luxury to me 😀 The colours there are gorgeous. I have to admit that this is the first fibre braid that I’ve bought. The girl I bought it from was trying to raise money for surgery for her cat, so she was selling off her stash. Our old boy had just passed on and I know how expensive the vet bills are so I bought the braid in support. Have yet to have the courage to spin it but hopefully soon. The quilt was easy I should have mentioned that I made it using a quilt tutorial from the Missouri Star Quilt company, I’ll go put the reference in there right now. Love the hat. The colours worked really well in it. Love the scarf too. I’ve looked at that pattern a couple of times but haven’t attempted it. Now I might just have to…lol. Thanks for the fibre photos to. Nothing like a fibre fix to get me motivated.